Fully multicoated optics (4 elements / 2 lens groups) with a clear aperture of 43.9mm / 1.73"
Back-focus spacing requirement is approx. 70mm from the shoulder of the 2" nosepiece to the image plane. Some customers have reported this to be 72-75mm. For visual use, connect the 2" eyepiece barrel to the main optical nosepiece (as shown in photo 1 above). Additional spacers might be required at the bottom of your eyepiece (not included) to place the focal plane of the eyepiece at the required back-focus distance. For photo use, unscrew the 2" eyepiece barrel and attach the included M48-T2 ring to the main optical nosepiece (as shown in photo 3 above). Then attach your D/SLR camera to the male T2 thread via a camera-specific T-ring (not included). Additional spacers will be required (not included) between the corrector and your camera's T ring depending on the camera's CCD chip location to ensure that your CCD plane is set to the correct back-focus distance from the corrector. 4.7 (Based on 27 Reviews) 96% of reviewers recommended this product. 5.0 FIRST EXPERIENCE A GREAT ONE! 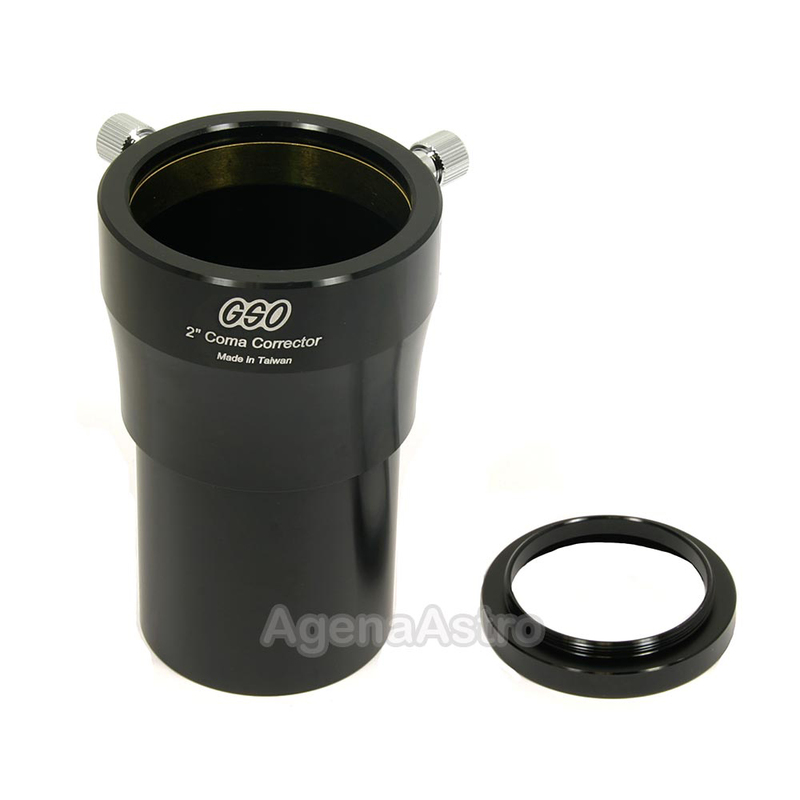 I purchased several GSO scopes from Agena. Two of the fast scopes, f:6 and f:5 in different apertures, showed a bit of coma, not untypical for fast RFT reflectors regardless of aperture. In the good old days, having owned fast Newtonians in the past, we didn't have the super or ultra-wide eyepieces, therefore the coma wasn't very obvious in the 50 degree AFoV of a Plossl in those days. In fact the limited field literally made a corrector unnecessary for visual use as it fell outside the field of view.. I decided on the GSO coma corrector primarily because my GSO scopes are outstanding performers; hands down winners. GSO has become synonymous with 'great optics' and the manufacturer puts his own name on them! Other optics from mainland China put someone else's name on theirs and you might be amazed to know that your scope was one of millions produced by questionable, often mediocre Chinese optical corporations. At any rate...The GSO Coma Corrector is very well manufactured and machining and finish as well as the optics and coatings are textbook perfect. It does require a .75" x 2" spacer to work properly. This is an inexpensive item and fits neatly between the corrector lens and the 2" eyepiece assy. that uses compression rings to keep eyepieces in place without the metal to metal screws that can scratch your eyepiece end tubes. This was very easy to assemble and looking through both GSO Newtonians showed a marked reduction in coma in 66 and 70 degree eyepieces. Off-center images were much sharper and very little coma was observed, so a real winner, especially compared price wise with the competition, no contest! The unit also comes with an adapter that can couple directly to the corrector lens housing and a 'T' ring to fit your camera. So, this is great for both visual and photographic use, although for the moment I haven't done any astrophotography using this system. Bottom line: For anyone experiencing coma in a fast telescope with a 2" focuser, this coma corrector is fantastic. Priced well below the competition with perfect optics...you just can't go wrong with GSO or Agena! Vague back focus distance (70-75 mm) and need to purchase additional spacers to get optimal performance is the main concern. 4.0 Great with a spacer ring! Spectacularly flat view on my GSO 12" Dobs, especially with ES 82 degree 30mm. Knocking off one star because it needs an extra spacer ring to work properly. A 3/4" spacer (plus existing parfocalizing ring on the eyepiece) did the trick for my scope/eyepiece combination. First off, make sure you buy a set of spacers with this coma corrector. This product requires ~75mm from image plane to the corrector. For imaging with a DSLR, this is usually a single 20mm spacer. There are no directions provided with this item. I found that with a cropped sensor DSLR (APS-C) on an f/5 telescope, coma correcting is not necessary. The corrector helps just a tiny bit. With that in mind, you may only need this product if your scope is an f/4.5 or faster, or if you are using a full frame camera. One pro I found with this corrector was that the 1.1x Barlow effect was enough to allow my Orion XT-8 to reach prime focus with my camera, whereas before I did not have enough back focus and had to use the GSO 2x Barlow piece. recently bought one to be used with GSO 8" F4 scope and nikon D5300 DSLR. i can see very good results with it. more details on how i connected it to DSLR and results can be found here. Good price and everything was as advertised. Came on time and in great shape. This is the third item purchased recently and all have met my expectations. Works well visually, cleaned up 70-80% of field with my previously nasty inexpensive 2" eyepieces in my 5" f5 scope. Needs a spacer ring to work properly with my Nikon dslrs- 1/4" I bought here looks good on initial testing, I've only done a few shoots with it though, cloudy weather here. An essential piece of equipment for imaging with a Newtonian astrograph telescope. Virtually eliminates all appearance of coma in DSLR images. Very pleased with the performance and quality of this product. Highly recommend it. There are other, much more expensive, coma correctors on the market, but this matches their performance at a faction of the price. Excellent product. I rate this product with 5 stars, because it works great. But it is MANDATORY that you order a 25mm tube extender for it, otherwise it will not work in focus. The lens-to-eyepiece distance has to be close to 75mm, and the corrector only supplies 2 inches of that. Review by Mike from Detroit of Detroit. The outside 30% of my Zhumell Z8 showed coma (where the stars look like seagulls). This got rid of that! The Z8 is an f/5.9 telescope. The Z10 and Z12 are f/4.x which means they're unusable without a coma corrector. It's this or the parracorr. You can buy four of these or one parracorr. I've read that only telescopes under f/5 have coma that needs correcting. WRONG! With wide angle eyepieces or most low power eyepieces most reflector (mirror-not lenses) telescopes that are shorter than a human being will GREATLY benifit from a coma corrector / field flattener like this. My test: look at a field of stars. Towards the edge of the eyepiece view the stars look like seagulls, while near the center they look like asterisks * like they should. Pop this onto the telescope eyepiece tube and pop my 32m eyepiece into this and all the seagulls are gone! Put it in and leave it there forever! Simple, huge noticeable improvement, cheap. Review by JJack of Midwest. Purchased from Agena and received it in 2 days. There's a great thread on one of the forums about setting these up - but in brief you can either buy the 19mm spacer sold by Agena or simply move your eyepiece out that amount to achieve focus. I bought the spacer and it fits into the middle of this corrector (unscrew it and put the spacer in). Review by John B. of White Hall, MD. Fantastic product!!! Several of my Newtonian scopes are tightly designed with a very low focus height. This allows a smaller secondary mirror and hence smaller obstruction, but can also make used of corrector lenses more challenging. That is where the GSO Coma Corrector is brilliantly designed. You can simply unscrew the Corrector lens assembly from the upper 2" inlet part, and screw the lens assembly to your favorite 2" eyepiece just like a filter. Instantly you have a Coma Corrected view with no "focus in travel" issues. Depending on the exact eyepiece, you may want to add a 2" diameter spacer ring. For example, my favorite 26mm and 31mm Type 5 eyepieces do best with a 1" thick spacer ring. These spacer rings are readily available on-line. The sharpness of the corrected view compares very well with other 4-element coma corrector products from other makers from side-by-side testing I did. I also did a comparison against a popular European-made 2-element zero-power coma corrector, and the correction was much better in the 4-element GSO model. The GSO model also had less vignetting or light loss at the edge of the field than some other products. This is because of the larger lenses and larger light path at both ends of the corrector. The only improvement I would like to see is somewhat better coatings. Under ordinary room lighting the reflections off the optical surfaces look brighter than some of the premium optics. But in real use I can't say that I noticed any deficiency in the coatings. Overall I would highly recommend the GSO Coma Corrector to all fast Newt owners who have a low focus height or are on a budget. Review by Quesne of Pennsylvania. I am very happy with this GSO coma corrector. It works well with my 2" Celestron EPs, and with my 1.25" EPs using the included adapter. The construction material seems to be good quality. The optics are clear and the machining is tight. 4.0 Way better than expected! I use this with my Z12 dob and leave it in the focuser full-time. I added a 1/4" and a 1/2" spacer between the optical section and the 2" eyepiece adapter. This gave me 19mm of additional length. All of my ES82's, ES68's and ES70 come to focus within 2 mm. I only had to add one parfocalizing rings to 30mm ES70 to make it focus at the same point as all the other eyepieces. I gave it 4 stars only because it does not include instructions, however, once I figured out how to make all of my eyepieces work with it, I found I do not need a tunable top at all, making this coma corrector a real bargain and relatively lightweight. I am very pleased with the results. My 38mm SWA is the cruelest test for my rig and the stars are tight for about 90-95% of the FOV. My 30mm and below ES eyepieces have tight stars right to the edge of field and only a thin ring near the field stop show seagulls. I cannot speak for astrophotography since I only use my dob for visual use. Review by 114nakano of Japan. I choosed Easy Use than Best Performance. I hope to compare this with Paracorr. Review by REC of NC. 5.0 Great Service and fast shipping! Seems like a well built product and a much lesser price than others. Would be helpful to have some user instructions to get the best use out of it. Review by skngblkhole of Charlotte, NC. I recently had acquired an 8" f/4 Newtonian and wanted to loose some of the coma inherent in such a fast system. A Paracor was not in my budget, but having read a number of positive reviews about the GSO corrector, I decided to give it a try. While it did improve the situation at f/4, it definitely works better in my f/5 dob. Stil, I am very satisfied and can recommend it. Review by Ken S. of Norwalk, CA. I bought the GSO CC to attempt to smooth out coma in an 8" short FL NR. It does a nice job although at the far edges of the FOV coma is still present. I haven't used a Paracorr but at its cost I probably never will. I'm not sure the added cost is justifiable although I'm only giving this product a 4-star rating as improvement is likely possible. Just the same, if you need to correct a fair amount of coma in your scope, you can't go wrong with this cost effective CC. Definitely recommended. Review by GadgetAce of San Antonio, TX. I purchased this coma corrector to help reduce coma in my F4.92 Zhumell 10 inch Dobsonian and have been very pleased with its performance. It has become an essential part of my bag of astro equipment that I never leave behind. Though it is heavy, it does exactly what it is supposed to do. [NOTE: It is critical that the telescope be well collimated to get the best results.] I find that this corrector is essential when using my wide-field EP's for deep-sky viewing. However, unless the seeing conditions are at their best, I do not find myself reaching for it to do planetary viewing. In addition to visual use, this corrector allows me to do prime-focus astrophotography. The stock Crayford-style focuser that comes with the Zhumell does not have the needed inward travel for prime-focus; so this was an exciting added bonus that I was not expecting! Of course I could opt for a new low-profile focuser, but now I can spend my money elsewhere. Overall, this is a solid performer for a fast Newtonian telescope and worth every penny! Review by ChuckWalters of Central New York. This GSO CC ranks right up there with the Baader MPCC and is much less expensive. Coma is all but eliminated! This is a great addition to anyone's astro gear collection and a great value. Review by spaceman of Indiana. Used for visual observation with 10in.x 1200mm dob. Without coma correction, this telescope has a fairly major coma problem at low power even with high quality eyepieces. Since most of my viewing is at 50x or less,this device is now a permanant fixture in this set up. Really does a remarkable job, with edge sharpness greatly improved. Is it as good as the high dollar compition? Due to the fact that this device is not adjustable to focal length, probably not as good with scopes of different lengths, but with my scope, You would be very hard pressed to tell the difference in edge performance. Five stars for sure. Review by jb-atlas of Virginia. 5.0 If you need it then buy this one..
purchased for my 16" dob, works great. Review by MrDougJones of Bloomington, IN. Very nice, works great in my Z12 12" dob doing nothing more than putting it in the focuser. My 1.25" EPs generally seemed right on, a "tunable top" to adjust the light path distance for 2" eyepieces might be useful but they were still pretty good and much better than without the coma corrector. This is immediately a permanent fixture in my scope. Review by Shneor of Davis, CA.